At a press conference yesterday morning, Bond 24 was christened Spectre, and Skyfall’s costume designer Jany Temime was confirmed to be returning. So what did Daniel Craig wear to this press conference? He dressed down elegantly in a jumper, grey wool trousers and a shirt and tie. Thanks to James Bond Lifestyle, the round-neck jumper is identified as the “Oxford” model from N.Peal, the same one that he wears in Skyfall. But it’s in a different colour: a deep royal blue that flatters Daniel Craig’s warm spring complexion. Under the jumper, Craig wore a white shirt with a narrow collar—presumably a point collar but it could possibly be a tab collar—and a navy tie. V-neck jumpers typically work better with a tie than round-neck jumpers do since the V-neck leaves a space for the tie. The round neck jumper awkwardly sits over the tie knot. On the other hand, a crew-neck jumper over a tie looks like something one would wear when removing a jacket after returning home from work. And that’s not necessarily a bad thing; it shows an unstudied elegance. Craig allowed shirt cuff to show beyond the jumper’s sleeves. Craig wore grey wool flat-front trousers with turn-ups and Crockett & Jones Molton chukka boots (again, identified by James Bond Lifestyle) with the jumper. The Molton is a three-eyelet chukka with rubber soles sold at Barneys New York. Craig’s boots were black suede, an unusual combination of colour and material. Black is the dressiest colour for footwear whilst suede is a rather informal material. Black looks good when it’s well-shined leather, and in suede it looses that characteristic whilst lacking the interest that the brown colour can give suede. Black suede looks very dull and flat. However, the black goes with the grey and blue in the outfit whilst suede chukka boots match the casual look of outfit. Black suede is very difficult to pull off due to its unorthodox nature, yet Craig makes it work. Daniel Craig’s outfit certainly looked elegant, but was it appropriate for a grand announcement of a new Bond film? Does it give insight to what he will wear in Spectre? Perhaps not. Craig wore a suit and tie at the press conferences announcing his first three Bond films, though only at the Quantum of Solace press conference did Craig wear an outfit from the upcoming film (the charcoal suit he wears in the London scenes). The Spectre press conference certainly looks like a more spontaneous affair than the previous press conferences, not only in the way Daniel Craig is dressed but also in the way the other actors are dressed. Nobody appears to be wearing costume. 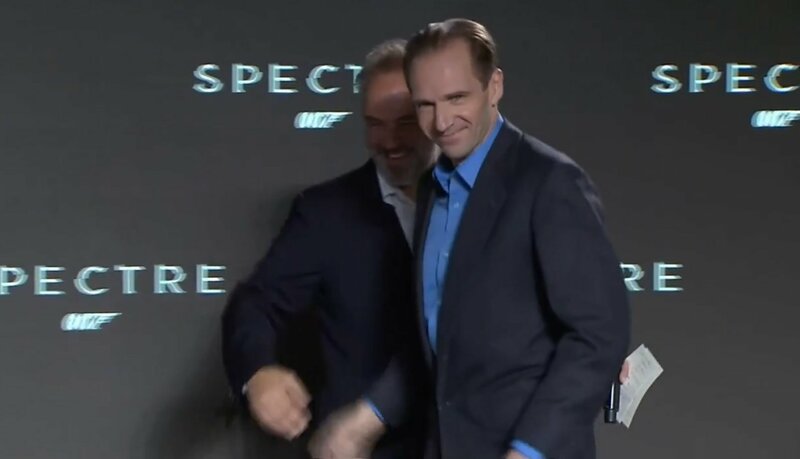 Ralph Fiennes, who plays M in Spectre, wore a beautiful charcoal birdseye suit with an azure blue shirt. The suit jacket is a button two with jetted pockets and no vents, and the trousers have forward pleats and turn-ups and are held up with braces that button on the outside of the waistband. However, Fiennes made the mistake of fastening the bottom button of the jacket instead of the top. The suit jacket has a fairly soft construction for what is most likely a bespoke English suit, judging by the full chest, natural shoulders and roped sleeve heads, and the lapel had rolled over the top button down to the bottom button. This was most likely the result of a poor pressing because no English tailor would design a suit to button so low as to show the trouser waistband above the jacket’s button. Fiennes’ wore shoes with plain toe and were likely chelsea boots, though they were mostly hidden by the trousers. Fiennes’ suit is also not one that should be worn without a tie. 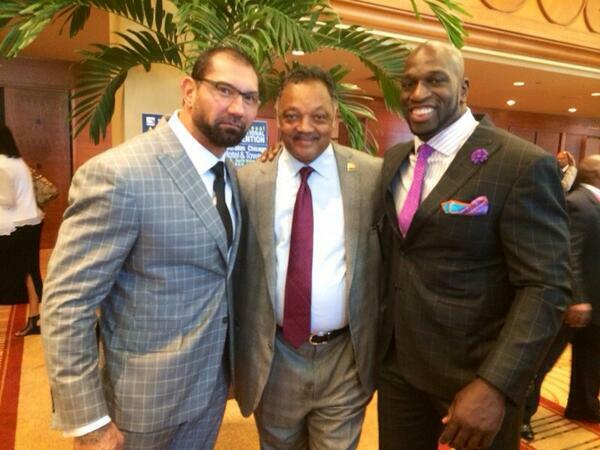 That suit and the occasion warranted a tie. 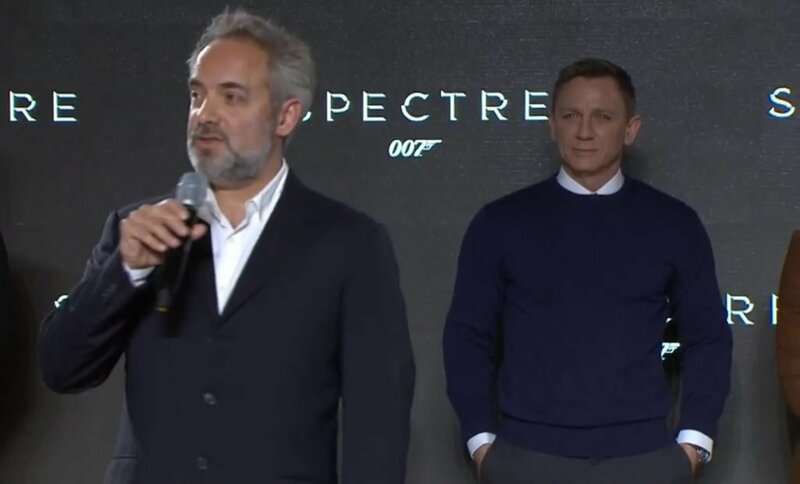 Spectre‘s Director Sam Mendes wore a sloppy-looking suit with both the sleeves and the trousers too long. It was as if he borrowed a suit for the event. The jacket has three buttons and he fastened the bottom two buttons. 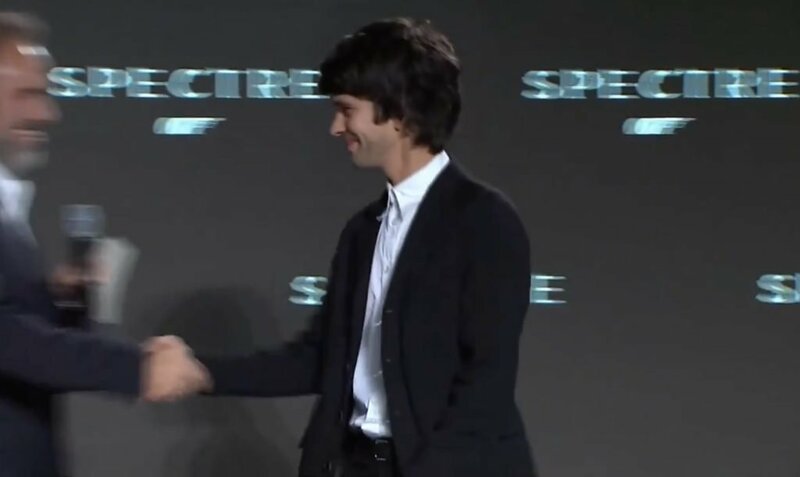 Ben Whishaw, who plays Q in Spectre, wore one of the least attractive outfits of the men at the event. He wore a black, button four unstructured jacket, baggy black trousers that bunch at the waist, black derby shoes and white shirt with the collar buttoned but no tie. He was probably inspired by the Twelfth Doctor to button his collar without a tie, but it is nevertheless an unattractive look. Rory Kinnear, who plays Tanner, dressed similarly to Daniel Craig in a jumper, though his outfit isn’t quite as refined. Christoph Waltz, who plays Franz Oberhauser, was perhaps the best-dressed man at the Spectre press conference in a outfit of a well-fitting suit and tie that’s appropriate for the grand occasion. The suit is a tone-on-tone brown Glen Urquhart check and has a button two jacket with flapped pockets and a single vent with flat front and plain-hemmed trousers. He unfortunately had the right pocket flap tucked whilst he left pocket flap out. He wore it with a white shirt that had an edge-stitched point collar and a burgundy tie with a brown grid and white dots. He knotted the tie in a windsor knot. His shoes are light brown cap-toe oxfords, a flashy and fashionable, yet stylish, choice. As always, what interests me about costuming is what is says about the characters. Is this a more informal Bond, one no longer feeling the restrictions of his position? Other characters, I think you pretty much nailed them. But these aren’t characters in costume, these are actors in what is most likely their own clothes. Mallory/M would never wear a suit without a tie. Most of my suit jackets and sportcoats have flapped pockets, and I have trouble keeping the flaps out as well. I’m not the only one, am I? I have never experienced this problem. The pocket flaps always stay where I put them, but that’s because I never use the outside pockets. That must be my problem. I often put things in my outside pockets. They’re handy! Is not using them a personal preference, or is that a style rule? IIRC, the literary Bond used them for his cigarettes or something similar. The only mention of the literary Bond using outside pockets is for handkerchiefs. It’s best not to use the outside pockets since the lines of the jacket will be more disrupted than if the inside pockets are used. There is no rule about not using the outside pockets, but I think it’s best not to unless they are used for sports. I find inside breast pockets are much more convenient anyway. I also have that issue with flapped pockets – I do use the outside pockets, mostly for temporarily storing sunglasses or a phone – I hate having anything bulky in the inside chest pockets of my jackets. Most of my tailored jackets have patch pockets, which avoid the issue – but to me, it’s not a sartorial faux pas, just a sign that the pockets are actually used, rather than being functionless window dressing. I’m not typically putting anything bulky in my pockets either, but I’d rather do that then carry it in my hands. I use the breast pockets as well, but what I really like are lower inside pockets. Some of my jackets have them, and I’ve considered adding them to others. The only pockets I almost never use are the back pockets on my pants. Matt, do you know if pockets (or specific pockets) on suits and the like were generally supposed to be used, or were they just for decoration? All pockets are designed to be used. Outer pockets, however, disrupt the lines of the jacket more than the inside pockets do. Patch pockets, unless with bellows or pleats, disrupt the lines of the jacket the most. I’ve never found lower inside pockets to be very useful since the jacket needs to be unbuttoned to reach inside them. Didn’t Craig look great though? He looks much younger looking than at the Skyfall press conference without the “enjoying death” stubble. His longer hair softening his features and giving him a much more classic Bond look the likes of which we have only really seen in QoS. I loved the outfit as it shows a cohesive blend between both Craig’s personal style and Bond’s look in the Macau and Scotland scenes in Skyfall. He clearly looks fit and ready to go under that jumper and it really gives one hope for a very visually appealing new movie from an aesthetic and sartorial point of view. For those who are interested his watch has been ID’d as a vintage Omega Seamaster on a leather strap from his own collection. The ladies looked great, as did Christoph, but yes, the less said about the others the better. RE my comment on Drax’s nearly invisible waistcoat, I similarly can’t understand why anyone would wear a tie under a crew neck sweater if it can’t be seen. As Matt says, they’re still rehearsing, I think it’s safe to say these are indeed the actors’ own clothes. Craig looks good here, though. Hair the perfect length. No military crew cut thankfully. He looked quite weathered at Skyfall’s conference but I guess that was the point, Bond had been through hell at the start of that film. Odd how no one said anything! They sat down and answered questions during the Skyfall conference. This will certainly be one interesting Bond film. Christoph Waltz has always struck me as perfect for a Bond-villain, he can play those larger-than-life characters without making it hammy. In my opinion some of the best Bond-villains are the ones played straight, like Hugo drax, Dr. Kananga, Kamal Kahn etc. and I guess that is why I find Elliot Carver to be the wort villain in the weakest Bond-film. In the back of my head, though, I am indeed a bit disappointed, after hearing the name of the film, that Waltz would not play Blofeld.. Many people are speculating that Oberhoffer is an alias for Blofeld that will be revealed in the film. Or Oberhoffer functions is a high ranking SPECTRE operative that, like Largo or Dr. No, serves as the MAIN villain of the film whereas Blofeld is somewhere in the background, unseen, pulling strings. But I’m not crossing my fingers. He is Blofeld. The DailyMail first reported the Waltz as Blofeld rumour and was spot on with all of its Skyfall scoops like Harris as Moneypenny and Fiennes’ character becoming the new M.
Also, when the Mail reported that Waltz was playing Blofeld, they also stated that he would be officially introduced as playing Franz Oberhauser, the son of Bond’s childhood skiing and climbing instructor Hans Oberhauser. They reported all of this prior to the press conference. At the conference, Waltz was announced on the official Twitter as playing Oberhauser. As such, their source is legitimate and the rest of the report that Oberhauser is actually in secret Blofeld is also correct. Mendes has never been one for a well fitted suit, just look at his appearances at awards ceremonies in the past. Craig and Waltz clearly look the best here, two men who obviously know how to dress well. Fiennes’ outfit is disappointing, but I think Andrew Scott’s attire deserved a mention; it’s a casual combination of jumper and jacket, but I think he pulled it off well. And Waltz may be the winner of the film, too. He’s the recent years discovery of film-making; at least I find him refreshing to each movie he was casted in. His roles in ‘Bastards’ and ‘Django’ were splendid, and don’t forget a bit forgotten Polanski’s ‘Carnage’. I get the feeling buttoning the top shirt button with no tie is going to pick up for the next few years. Though I think it works as a sartorial tic of the Twelfth Doctor, the rest of the time it looks like one just forgot a tie. As for the movie announcement, “Spectre” is a rather boring title, isn’t it? I know they’re proud that they have the rights back from the McClory estate, but the one-word, two-syllable title starting with S is a bit too similar to Skyfall by my reckoning. Haha, I knew Matt would call out Whishaw’s “air tie”. I think we may be overanalyzing what was a perfunctory media appearance. The production on this film is, if not rushed, a bit tight for today’s film production landscape. Mendes said they were rehearsing and it looks like they took a quick break, came out for the studio’s announcement, and then had to get back to work. Remember the story of Connery appearing at the Japanese press conference upon arrival in Japan in 1966; he came right out in casual clothes and without his toupee. The Japanese press was upset at his appearance, demanding to know if this was how James Bond dressed. Connery rightfully reminded the reporter that he is Sean Connery, not James Bond and liked to dress comfortably. I think that a good reminder that these are actors and not to confuse their screen personas with them. Craig looks great. And he is the only one who looks like he is costumed up, as the brands are Bond’s brands. As for the rest, if that is their own personal style, then more power to them. No individual needs to suit another’s notions of how one should choose to dress. 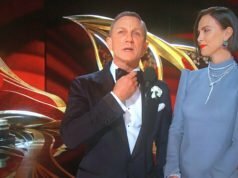 Daniel Craig wears a lot of the Bond brands in his personal life, so it’s likely that these are his personal clothes, just as everyone else’s clothes appear to be. How else can I comment on the announcement of the new Bond film other than analyse what people wore to the announcement? Looking at how these men are dressed in real life might actually be one of the most relevant posts on this blog. I also think SPECTRE is a fantastic title. Much better than the “Tomorrow Never Dies Another Day” variety, or the stretched Fleming phrases and references used in the post 1987 films. Straightforward, catchy, and conveys what the movie will be about – and that Blofeld will (presumably) inally get a proper screen treatment that Austin Powers can’t parody. I wasn’t referring to your post, which is informative and as well done as ever. And I agree that their personal tastes and appearances as events should be covered as well. Most people commenting here haven’t overanalysed the clothes, but others have. People have said Daniel Craig was wearing a “grandad jumper”, but I assume those people just don’t like jumpers at all. Older men I know don’t wear their knitwear so slim and aren’t showing off muscle. I do think that Craig’s more casual outfit may have some relevance to the film. 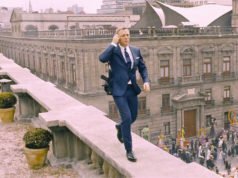 Given that a substantial portion of this film will take place in locations like The Austrian Alps and Morocco, I wouldn’t be surprised if Bond only wore one or two suits in this film. Frankly, if this comes to fruition, this may be a blessing since the fit of the tailored clothing will no doubt be terrible once again thanks to the return of Ms. Temime. Also, I wasn’t sure what you were referring to when you said “granddad jumper,” but I now see that Craig has taken some schtick for his ensemble. What a bunch of fools. He looks great here. Is it correct to show the shirt cuff beneath the sweater? I always make sure I do – it looks right in the same way that visible shirt cuff beneath a suit jacket looks right. I can’t see the point in wearing a tie if no one can see it. It’s fine to show shirt cuff or leave it hidden. I think it looks better to show shirt cuff, in the same way you show shirt cuff with a jacket, as you mentioned. Gentlemen, all very valid comments on the men and I agree that DC looks excellent, in character and ready to go. But what about our opinion on the ladies? Great to hear Dan say he thinks the script is better than the last one on the BBC. The last one had some plot holes large enough to drive a DB10 through so I hope that’s improves upon. Lea Seydoux looks breathtaking. Monica Bellucci has finally been cast after seemingly decades of being rumoured as the next Bond femme fatale – here’s hoping her resemblance to Solange and Severine doesn’t mean she’ll meet a sticky end. And despite my issues with Moneypenny and Craig’s Bond’s lack of chemistry, I think Naomie Harris looks fantastic too. It’s a real shame the majority of the male cast didn’t feel it necessary to dress to the same standard as the women. As has been mentioned it’s only Craig and Waltz who compare with the elegant choices made by the ladies. On an unrelated note: My god it’s still a year away!!!!!!!! I think it fine for Craig to dress down here. He’s dressed up enough as Bond in the movie. Looking forward to Christoph Waltz as villain again (Inglorious Bastards). I was definitely disappointed by Dave Batista’s cardigan – he’s worn some fun outfits as a wrestler – he makes mistakes but he clearly cares about what he wears. I have hope for Mr. Hinx. I agree that some are reading WAY too much into what people were wearing here, but there is the fact that everyone knew that they would be appearing at the photocall and be…photographed. – I like the more casual outfits in terms of concept; it makes it seem like these are a bunch of friends enjoying themselves and feeling no pressure at all. Given how effusive everyone has been in their praise of each other that’s probably not too far off the mark. – people are wearing their own clothes that reflect their own style. Am I upset that Whishaw wore what he wore? Of course not. He can wear whatever he likes. In fact, I like the contrast between between some of the actors here and their characters. It makes them seem much more like themselves at the event, and makes their appearances in the films much more “the character”. – I have seen “air ties” making a comeback in fashion shoots prior to the twelfth doctor. I think that they were trying to capture a trend just as it was breaking, much as they did with Matt Smith’s bow ties. I don’t think that this trend will be as pervasive, or as long-lasting, as bow ties though. – Craig’s black boots look good with his outfit. Is anyone else here old enough to remember black suede dress shoes being a thing in the early and mid-90s? I was reminded of that after rewatching La Femme Nikita a few months back and was wondering if they were due for a comeback. Interestingly, I’ve started to see them in high street stores lately (although a more thin soled, low-profile version). – I wonder if Fiennes put his hand down, felt the button, and buttoned up his jacket as he was going on stage without seeing or noticing that it was the bottom button? – I like that it was a photo-call and not a press conference. I suspect that if it had been a press conference there would have been a lot of repeated, deflected questions. I think that any questions that *would* have been answered would have been pretty basic (“Are you looking forward to working with ______?”) so why bother? And given how hard it is to keep away from spoilers, why have reporters ask questions that couldn’t be answered? So when do you think we’ll see the first pics of characters in costume? I can’t see anything leaking from Pinewood as it’s a controlled environment; I assume that as soon as they start shooting outdoors we’ll see some candid shots by the public. Craig’s outfit is sublime. Business/smart casual done the right way. Fiennes might have been a little off, but at least his shirt is an interesting colour to make up for the lack of a tie. Matt, is there any chance of you doing a piece on the Doctor’s style from the revived series? Ralph Fiennes’suit though improperly buttoned and clearly lacking a tie looks good. It does look indeed very British : the lapel buttonhole which you see clearly in interviews screams “bespoke”. I think it looks very much like one of his suits in “The Constant Gardener”. Could it be a leftover from that film which Mr Fiennes kept? Speaking of The Constant Gardener, Matt, I think you should consider writing some posts about Fiennes’ suits in that film. I recall them looking very Bondian. At one point in the film, Fiennes even wears the literary Bond’s navy suit with white shirt and black knit tie. I’m keeping my fingers crossed that the fitting issues are resolved that were so apparent in Skyfall. There really needs to be a master tailor on hand to give guidance to all of the actors once the wardrobe is designed and selected. And PLEASE no off-the-peg suits! Please don’t dress Craig in High Street-type overly tight suits again. It just looks like he ran them through the wash, instead of taking them to the dry cleaners. It’s awful. He’s in his late 40s. He doesn’t need to look like a trendy 19-year-old. Bond deserves better. So, they are finally bringing back SPECTRE. I’ve read somewhere that they are also bringing back Mr. White from CR and QoS. If so, will SPECTRE be revealed to be the same organization as QUANTUM? I’m glad that they are finally going to follow on that story thread. And the release date is set at November next year. IMO, that’s no time at all. I just hope they don’t rush the movie and end up making a mess of it! I like what Craig is wearing here, although maybe it is a bit informal for a press conference. When I first saw the picture, I thought it looked similar to what he was wearing in Shanghai. But I prefer the Shanghai outfit because of the V-neck of the sweater. The crew neck just doesn’t show the tie at all! And I really like his haircut. I’ve actually thought that the very short cut in Skyfall was a result of minimizing the effect of his actual hairline receding. Glad I was wrong. I don’t like Whishaw’s buttoned collar with no tie but at least he’s wearing a suit (it is a suit, …right?) and tucked his shirt in. I’ve seen some people do this with an untucked shirt which I find to be a weird mishmash of casual and uptight. I agree with you on the haircut. The very short cut in Skyfall gave the illusion that his hair is thinning. His hairline is receded more now than in Casino Royale, but longer hair does a better job masking it. Wishaw is not wearing a suit. Btw, his attire at the Spectre press announcement is excellent. He looks very fit, and I have no doubt the casual clothes will look great on him. I just hope the suits fit him better this time. I wish we had more on the navy tie. But other than that, this outfit harkened back to the Skyfall ‘Chauffeur’ outfit only with a different colored jumper and tie. i like these kinds of combinations. Matt, have you seen the photos from the Rome set of SPECTRE? Looks like Craig in a navy double breasted suit with brown derbys or chukkas. Yes, I’ve seen these. This is Daniel Craig’s personal outfit and not what he is wearing in Spectre. The point-collar shirt, however, may be the same as the shirts he is wearing in the film. I’ve seen another photo of Craig at this the event and it looks like he is wearing a slim french cuff shirt with the jumper and it bunches a little bit. Craig wore a french cuff shirt with his black Tom Ford cardigan in QOS, so he could be doing the same here.